Expovina 2018, one of the largest public wine fairs in Europe, will transform Zurich into the Swiss wine capital for two weeks. 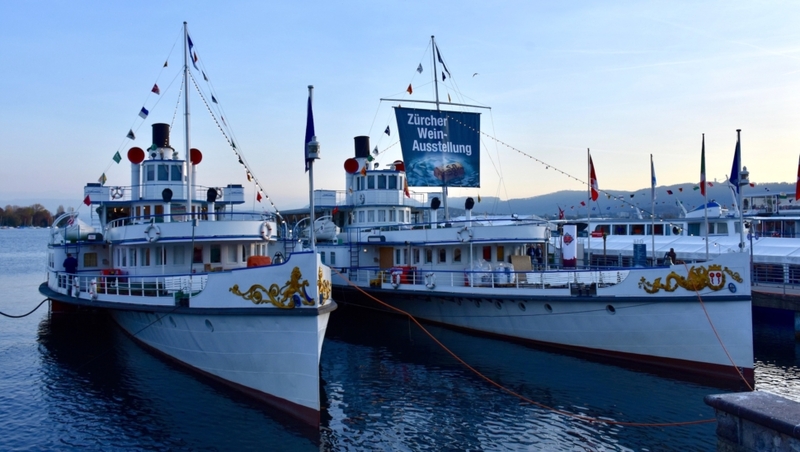 Traditionally, this incredible wine fair is held by 12 wine ships on Zurich Lake. This year, it is taking place from 1st to 15th of November. For 65th time this year, wine producers, experts and wine lovers will be meeting to review the latest developments in the wine industry and, of course, to taste and purchase amazing wine. It’s also an important meeting point for wine producers to discuss relationship between wineries and big distributors as well as progressing in online purchases and wine fairs. Expovina 2018 presents more than 170 wine producers and 4000 wines, from 25 countries. Switzerland once again leads the offer during EXPOVINA. Wines from 15 wine-growing cantons illustrate the variety of varieties, soils, climatic conditions and wine-growing personalities. European wines are dominating among foreign wines at the wine fair. In addition to the classics from the north and the center of Italy, the importance of the south and the islands continues to grow – a trend that continues in Spain, Portugal and the south of France. A treasure trove especially for lovers of amazing white wines is the offer of wine-growing regions from Germany and Austria. The presence of Eastern and Southeastern Europe has also gained in importance. They surprise with excellent wines from both independent and renowned varieties. Location: wine ships at Bürkliplatz, which can be reached by any tram that goes through the tram stop “Bürkliplatz”. From Zurich main station (Hauptbahnhof): the tram #11 to the direction Rehalp till the stop Bürkliplatz. From Zurich Stadelhofen SBB station: the tram #11 to the direction Auzelg until the stop Bürkliplatz. Other trams that go through the Bürkliplatz tram stop: #2, 5, 8, 9. Sunday 11:00 to 19:00 (ticket office closes 18:30). Prices: Entrance fee – 25 CHF (incl. Catalog), cash, bank cards and credit cards. There is a wardrobe – 2 CHF (cash only). There are also three restaurant-ships for memorable culinary experiences. Fine pasta is available in the Mediterranean ambience of “MS Wadin”. Lovers of cheese specialties can enjoy Valais raclette or Gruyère fondue at “Panta Rhei”. And if you want to crown the journey through the world of wine with a delicious fish or meat dish, it is best to visit the elegant “Rosenstadt”. Dogs are not allowed at the fair. More information about Expovina 2018 you may always find on the official website. In the elegant WeinForum tent, Georgia is the first host country of EXPOVINA to present its assortment of ancient traditions. Guests are invited to explore the viticulture, wine making and wine-growing traditions from the area where vines have been grown and grapes pressed for more than 8,000 years. Georgia is considered the country of origin of viticulture and is therefore also known as the “cradle of wine”. I find it really exciting, to talk directly to the wine makers and learn more about historical growing areas between the Caucasus and the Black Sea. 2016 Fore Estate Reserve Blend, Vina Robles. Red wine from California, USA. It has an elegant bouquet with ripe flavours of black cherries, wild berries and spices. Blend: 50% Cabernet Sauvignon, 40% Petite Sirah, 10% Petit Verdot. 2017 Diolinoir, Clos Du Mont, Les Grands Murs. Red wine from Valais, Switzerland. This full-bodied strong wine has a fruity bouquet of plums and black cherries, with balanced tannins. Grape: Diolinoir. K, Konrad Lifestyle. “K” stands for Konrad. That is a last name of world-famous DJ Antoine. His passion for wines has developed into a modern brand. Konrad Lifestyle is now offering a wide range of exquisite wines and champagnes, that are made at some of the best wineries in Europe. You are always welcome to share your wine tasting experience and favourites in the comments below.